If you don’t take the steps to protect your gaming accounts you could potentially lose hundreds of hours of gameplay time and also have your personal information compromised such as credit card, home address among other important information. Personally, I have put 84 days of game time into my World of Warcraft character which is on the low end. Imagine having all that wiped out in seconds. 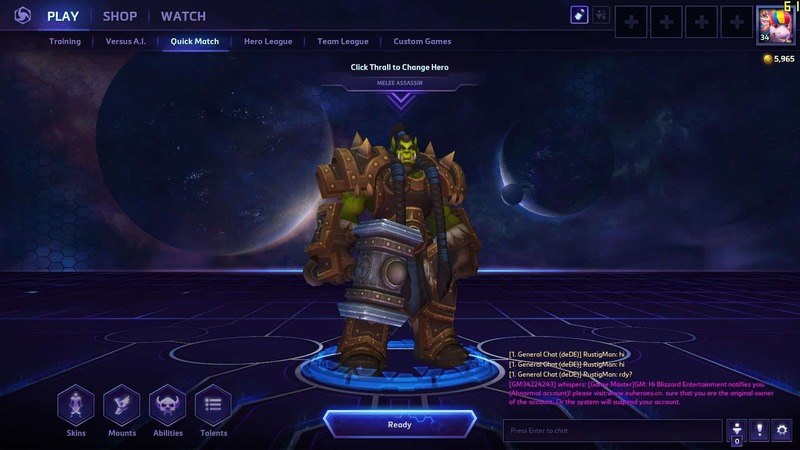 In huge games like World of Warcraft there is usually always a black market for items or in game gold that translates into real world dollars. Don’t panic though, below are a few ways to prevent this from happening and also some steps to make your game accounts more secure. One of the simplest things you can do to keep your accounts secure is to change your password regularly. The rule of thumb is to change your password every 90 days or so and make sure your passwords are different from your other accounts. If one of your passwords gets cracked, they won’t have all of them if you keep them different. Also, use complex passwords. Long is strong, so consider using a passphrase. You want to make them something that you remember without having to write it down. If you have trouble doing this, use a password manager. Another thing you can do is add 2 Factor Authentication to your accounts. What this does is it adds another layer of complexity to the login process. How this works is in addition to your password you will be prompted to enter a set of numbers. These numbers will change every 60 seconds or so. You get these numbers from an app that is on your phone or can even be on a separate dongle device. Most gaming companies offer a free in game item or in game currency for setting up 2 Factor Authentication. I have been hacked personally before I put this on my account. Since then I have had zero issues. Blizzard even makes it easier than most. Instead of having to enter a set of numbers you just have to hit “Approve”. Overall these are quick and simple steps you can take to making your accounts more secure. One thing to watch out for in any game is “In Game Chat Phishing”. While you are playing a game, you might get an in game message or chat from someone who is pretending to be a GM or general manager. 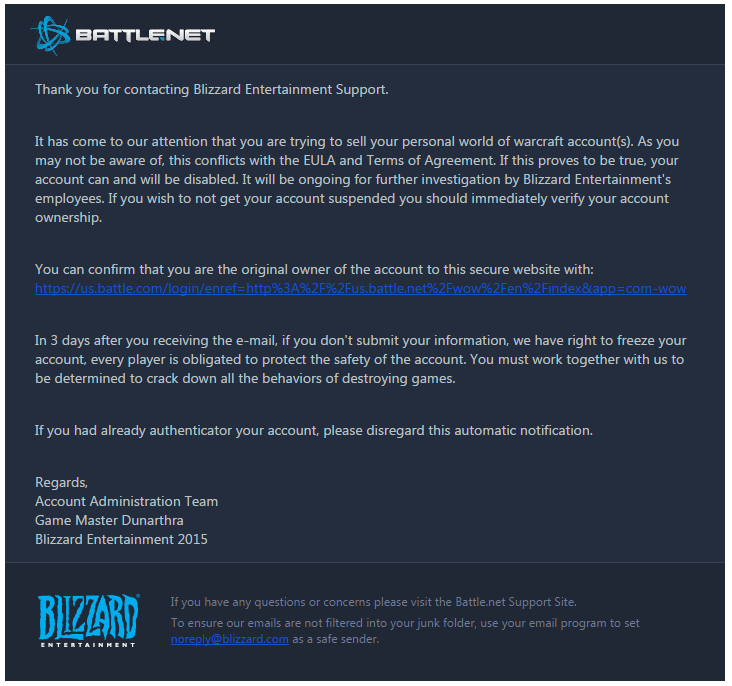 They might say something like, “we have noticed your game account is not secure, please click here to change your password or you will be kicked from the game.” The messages are usually always urgent and usually threaten to kick you out of the game if you don’t act immediately. It can be hard to tell sometimes if they are a legitimate message because the hackers go to great lengths to make them look the same. My rule of thumb on this one is 99.9% of the time I just ignore the messages completely. Never click on any links, and if they ask you to change your password go about the way you normally would. Gaming companies almost always email you in this type of situation and if you ignore the message and get kicked out of the game then you know it was a legitimate request. No one can kick you out of the game unless they work for the company. If you attempt to log back in and get a message that says, “Your Banned” or something like that, then go check your email and it should explain why this happened and what you can do to bring your account back into good standing. Unfortunately, you will have to be on the lookout for the same type of stuff in your email as well. These can be even harder to notice because they look so real. Even the website they refer you to can be so close to the real thing it’s hard to tell the difference. Sometimes it’s almost impossible to tell which is which. In this situation it’s best to google current phishing scams because usually if it’s a scam other people have also run into it. If you are still not sure, the best thing you can do is call the gaming company directly. I know this might take time and some gaming companies are hard to get a hold of, but that is what the hacker is hoping for. He is hoping that you won’t take the time to look into the email and give them what they want. Calling the company, however, is the only way to be 100% sure it’s not them. They most always will be happy you called to check into the issue. This gives them information they can use to fight this in the future. Just like keeping your house and car locked up nice and tight, it’s important to do the same thing for all your gaming accounts. It may not seem like it would ever happen, but unfortunately I have seen it happen to me and some of my good friends. The hackers never stop or slow down. So if you want to continue to save the world, save the princess, or finally make it to #1 in Battle Royal, while keeping yourself safe from hackers and fraudsters, remember the 3 tips that I have given you today: Make your password strong and enable 2FA, beware of game chat phishing, and verify emails to avoid scams.